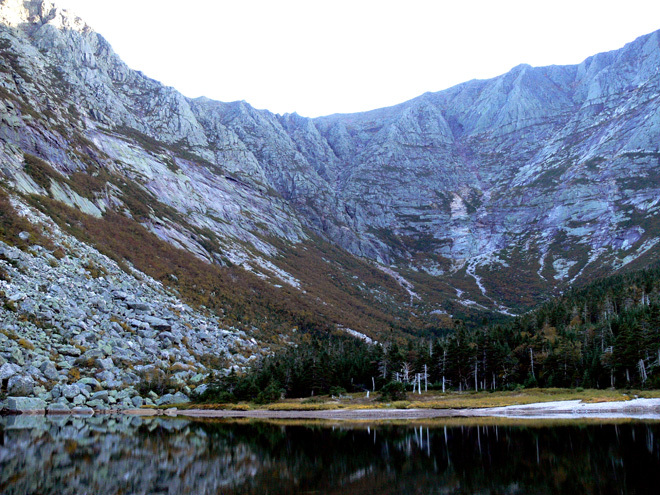 In the concluding installment of Don Perkin’s review of Baxter State Park, he climbs Mount Katahdin. I vividly recall a professor speaking when I was in college as an English major in Portland, Maine. He lectured on elements of “the sublime” in 19th century literature saying its roots are in describing awe inspiring landscapes or situations where one’s watching a terrifying sight but is safe from one’s particular perspective - like witnessing a tall ship hopelessly pitching in a night storm heading for the rocks, its passengers screaming, helplessly. As far as landscape was concerned, the professor put his book down and looked out the window as if at a loss to describe it. “Unlike the Rocky Mountains, we really don’t have any sublime features of the landscape here in the East,” he said. I knew right then and there that he had never been to Mount Katahdin. 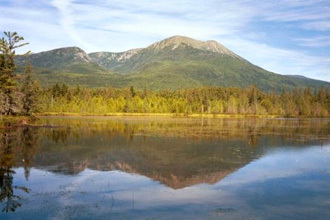 Katahdin is an Abenaki word meaning “greatest mountain.” Native American lore abounds in regards to this ancient monolith. Though only a mile high (thirteen feet short if you want to be technical), Katahdin is unique and awe inspiring largely because it is so singular - it’s not part of a mountain range. The glacial ravines and jagged peaks of rock abruptly rise from the otherwise flat surroundings. “The Knife Edge,” a rocky trail along a spine connecting three Katahdin peaks is but three foot wide in some places. 1,000 foot drops await those who stray a step too far. By any description, Mount Katahdin is a sublime landscape. As the crowning jewel in Baxter State Park, Katahdin has many diverse trails and takes hours to climb. For years it served as the northern terminus of the Appalachian Trail. 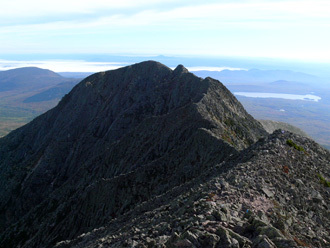 Many “through hikers,” those who hike the entire 2,175-mile stretch beginning at Springer Mountain, Georgia, often attest that Katahdin is the most impressive summit of the entire journey. Only about one in four finish the “AT.” Recently the Appalachian Trail was extended into Canada, but because it’s so striking, many still consider Katahdin the northern terminus. The first time I climbed this peak, I retraced Thoreau’s route that’s now called the Hunt Trail. It bears the white blazes of the Appalachian Trail to the top of the mountain. It’s a long and demanding route. Once you’re above tree-line, iron bars drilled into the massive, car-sized boulders assist your ascent. 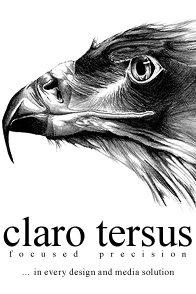 I don’t know how poor old Thoreau managed without these. Starting from Baxter Park’s Katahdin Stream Campground, this route can take some twelve hours round-trip, but is well worth the effort. I’m surprised to learn when discussing the mountain that many lifelong Mainers have never visited the jewel Percival Baxter so generously gifted to the people of Maine. Even if one never hikes its rocky features, the park affords many good views of the mountain that can be glimpsed by car. If you’re going to hike, plan ahead and get a site at one of the several campgrounds at the base of the mountain. You’ll need all your energy for the climb and will not miss driving the hour back to the nearest town. Besides, being a wilderness preserve, parking in Baxter State Park is limited; lots often fill up early in the day. So get those boots on. 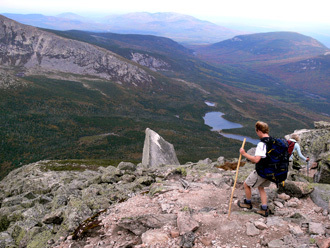 Katahdin’s an experience you won’t ever forget! Ha! New England has the sublime after all! For more on Baxter State Park visit their website.